Baa Atoll is often listed as one of the best places in the world to see manta rays. The season goes officially from May to November, when the Southwest monsoon brings a lot of plankton, consequently attracting the hungry mantas. But what can one see during the Northeast monsoon, a.k.a off manta season? That is one very frequently asked question, and here is the answer…plenty of things! The Northeast monsoon brings good visibility and stronger currents, which means more chances of seeing sharks. 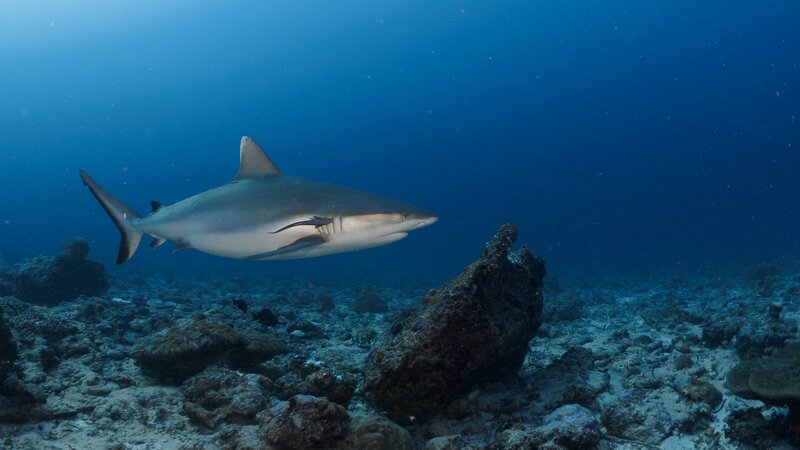 Lately, we had some great dives with grey reef sharks in a close by dive site, only 5 minutes away. 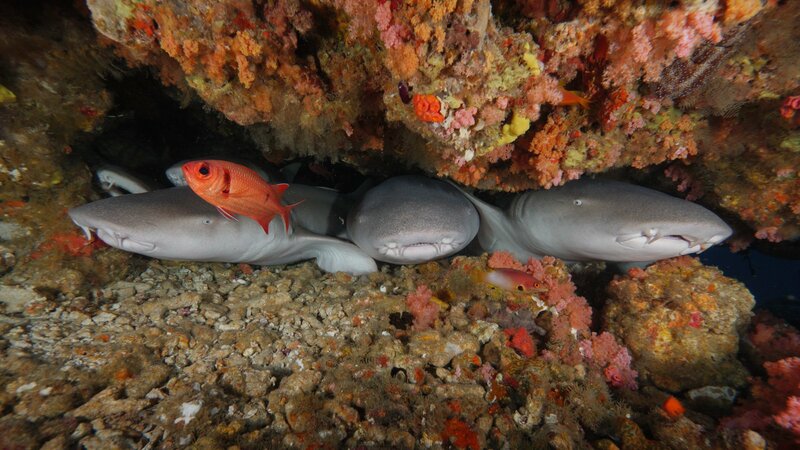 Very often we find nurse sharks sleeping under the overhangs. Sometimes a bunch of them together. Blacktip sharks are also around, and sometimes we even encounter a lemon shark in our house reef. It seems to be a resident, as snorkelers and divers have encountered it several times. The mantas are not around but their cousins are. Eagle rays and different species of stingrays are commonly observed during the dives. 30 m visibility, blue water and a school of eagle rays gliding by, can you imagine it? It is truly spectacular! Here in Baa Atoll we have a variety of stingrays: cowtail, white-spotted whipray, blotched fantail and porcupine rays. Apart from rays and sharks, there is plenty of fish life, big schools of fusiliers and blue-striped snappers. It’s also possible to see some pelagic fish, such as tuna, barracuda, blue-fin jacks and golden trevally. That is also the time of the year when we have a lot of dolphin sightings. The flat sea makes it easy to spot them from the boat and sometimes we get lucky and see them underwater. So, what are you waiting for? Book your holidays at Kihaa Maldives and come diving with us!